As someone who has spent nearly his entire career pushing for Palestinian rights, working with MPs, taking them on visits to Palestine to see the situation Palestinians face under occupation, the whole crisis over antisemitism fills me with both anger and sadness. Not only do I abhor any form of racism, I also see the devastating impact of antisemitic comments not only on the Jewish community but on the Palestinian cause as well. So I find it upsetting because I detest racism, bigotry and discrimination; and also because it harms the cause to which I have dedicated all my professional life. The number of people spreading, or turning a blind eye to, ignorant, prejudiced ahistorical conspiracy theories, holocaust denialism, and the like is just appalling. No ifs, no buts. How many more times do we have to read comments saying the “BBC is controlled by Jews” or that “Jews buy up all the media”? 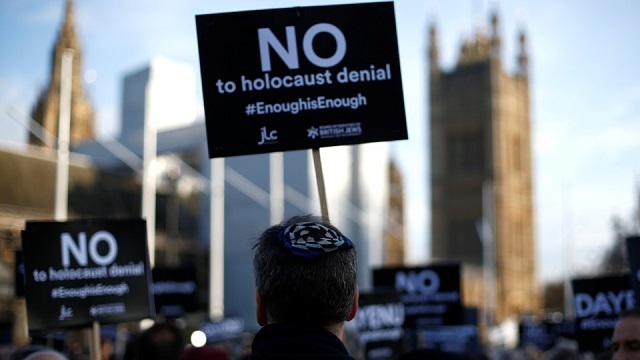 Anti-Jewish hatred exists in all parties, but this does not mean the Left does not have an issue, and this should not be dismissed as merely part of an anti-left or anti Corbyn agenda. Jeremy Corbyn’s failure has been one of a lack of leadership on this issue. The way he handled it has created a climate where many Jews do genuinely feel very uncomfortable being part of the party he leads. Like many, I do not believe Jeremy himself is antisemitic and, for sure, as ever in politics, some of his opponents are trying to make the most of this opportunity to slam him. But the trouble is Corbyn simply has not acted hard and fast enough to make antisemitism as unacceptable as it should be, leaving himself open to charges of complacency. Corbyn should have spoken out much earlier and ensured, at a minimum, that the recommendations of Shami Chakrabarti report were implemented. The case of Christine Shawcroft was just the latest example. As chair of Labour’s disputes panel, on what planet was she on when she called for a candidate who had reportedly posted that the “Holocaust was a hoax” to be reinstated without, by her own admission, having read his comments. Either she was stunningly incompetent, or willing to overlook the issue. She remained on Labour’s National Executive Committee for several days afterwards, before being compelled to resign. That is not “zero tolerance”. At the same time, we face a rise in anti-Muslim hate as well. This has to be addressed just as strongly and vigorously. Neither Theresa May, nor her predecessor, David Cameron, have done enough to challenge this. Boris Johnson is in no position to chastise Corbyn given his own past record. When Editor of the Spectator, Johnson published an article by Taki which stated that “Orientals … have larger brains and higher IQ scores. Blacks are at the other pole.” At a public debate a few years later, Johnson infamously referred to black people as “piccaninnies” with “watermelon smiles”. Instead of censoring and suspending him, as should have happened, the Conservative party made him Foreign Secretary. These are not isolated incidents on the right. 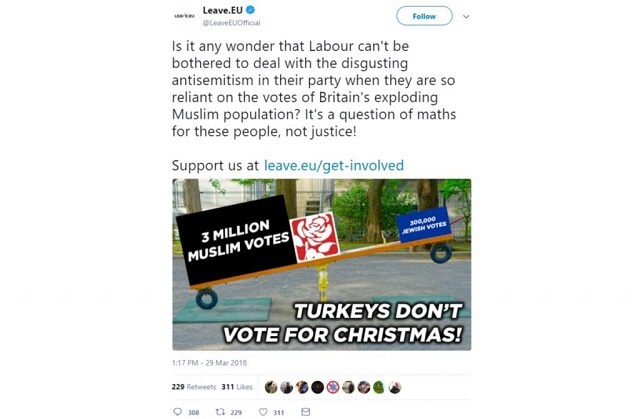 Leave.EU, the campaigning group, plumbed the depths last month when it posted a tweet in which it asked rhetorically: “Is it any wonder that Labour can’t be bothered to deal with the disgusting antisemitism in their party when they are so reliant on the votes of Britain’s exploding Muslim population? It’s a question of maths for these people, not justice!” This was rightly condemned by the Board of Jewish Deputies, and it is hugely welcome to see so many voices unwilling to allow this division to be exploited. Likewise, I have utter contempt for those who embrace anti-Semites simply because they appear to back Israel. How can Israeli leaders, including Prime Minister Netanyahu, tolerate the likes of Steve Bannon, with his record of racism and support for neo-Nazi movements? The Zionist Organisation of America, likewise, offered public support to Bannon, a position that attracted considerable outrage amongst American Jewish communities. What about those who did not speak out against the disgusting antisemitic campaign targetting the Hungarian-born Jewish businessman George Soros, launched largely by white supremacists who objected to his views on immigration, Brexit or Israel? 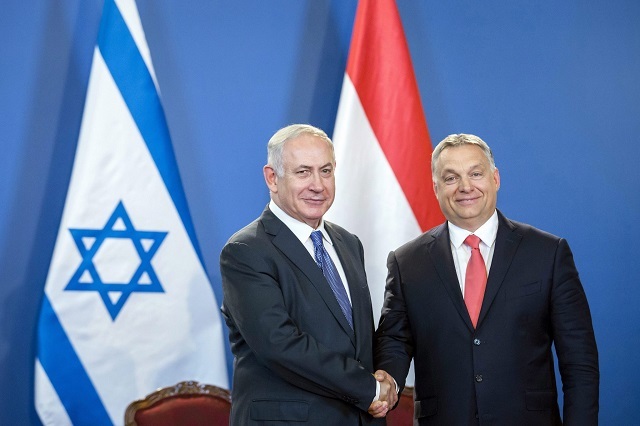 Netanyahu not only said nothing but instead was happy to stand should-to-shoulder with Viktor Orban, the Hungarian Prime Minister, whose party had waged the anti-Semitic campaign against Soros. Netanyahu’s son, Yair, even posted on Facebook a grotesque anti-Semitic cartoon depicting Soros dangling the world in front of large reptile, a cartoon that subsequently was promoted by antisemitic websites, including by the Ku-Klux-Klan leader, David Duke. In the same foul boat, I would include those who make fake and exaggerated claims of antisemitism to smear people because they do not like their views. This is in itself a betrayal of all the millions of victims of this ancient hatred. You cannot cherry-pick in the fight against racism. This is why no friend of the Palestinians should be silent about some of the anti-Jewish imagery on Palestinian media, or the anti-Jewish rhetoric by Hamas and Hizbollah. No friend of Israel should be silent when Israeli leaders compare Palestinians to animals, or call for water and electricity to be cut off to two million Palestinians in Gaza. Of course, true friends of Israel should be demanding an end of the occupation as well. Check out the posts that were made on a Facebook Group, Palestine Live, which included Holocaust denial and all forms of historic anti-Jewish tropes based around the Protocols of the Elders of Zion , conspiracy theories about Israel and 9/11, and the Rothschild family running the world economy. Start questioning the sense and insensitivity of comparing what is happening to the Palestinians to what the Nazis did before and during the Holocaust. Scores of politicians, thinkers, academics, human rights campaigners, lawyers, religious leaders, aid workers rightly speak out for Palestinian rights in the strongest terms on an almost daily basis, without needing to express a scintilla of hatred except for the crimes and injustice they oppose. Amongst them are many people who also happen to be Jews and, indeed, Israeli Jews prepared to take a stand often at great personal cost. For the Palestinians, they are damned by both plagues. They suffer from anti-Muslim prejudice and hatred, but also their noble cause for justice is undermined by antisemitism amongst too many — once again, one person is too many — in pro-Palestinian movements. The chances of achieving their legitimate rights will increase a thousand-fold without this scourge contaminating their cause. Palestinians need our support. They have endured more than fifty years under occupation; seventy per cent of them are refugees, with no state of their own, and suffering a whole host of human rights abuses. Questions should be asked of those who do not support their liberation and their legitimate rights. For instance, it was valid to criticise Theresa May and her government for celebrating the Balfour declaration, given what has happened to the Palestinians as a direct consequence of that fateful promise by Britain 100 years ago. So to all antisemites out there, enough of your bile, get the hell off the Palestinian case, and scurry back under the stones from which you crawled out.